In 751, a Muslim army and a Chinese army clashed on the banks of the Talas river. It’s easy to understand why the battle of Talas in 751 between the Abbasid Caliphate’s Arab-Persian army and the Chinese army is often said to be one of the most important battles in Central Asian history. It was, as James A. Millward wrote in his 2007 history of Xinjiang, the “first and last meeting of Arab and Chinese armies.” For many it marks a decisive point in history–”barely noticed by contemporary chroniclers” wrote Svat Soucek–which decided whether Central Asia would come under the influence of the Muslim world or the Chinese. The battle of Talas itself decided very little, but its timing was critical. The Abbasid caliphate in 751 was in its ascendency, having replaced the Umayyad Caliphate in 750. When the Abbasids began their open revolt in 747 the first city taken was Merv (Mary, in modern Turkmenistan). In the early 700s, Qutayba bin Muslim captured several key cities in Central Asia for the Umayyads–including Bukhara and Samarkand–before being killed in 715 by his own army (he’d refused to pledge himself to the new Umayyad Caliph upon the death of Walid I). Over the ensuing three decades, internecine wars and revolts against Muslim governors wracked the region and opened the door to the Chinese who were working their way back west through Tibet and Xinjiang. In 693, the Tang dynasty re-established its control of the west, though it did not reclaim Kashgar until 728. With the rise of the Abbasids–who would eventually move the caliphate’s capital east from Damascus to Baghdad–the caliphate would again look east to expand at the same moment local politics would draw the Chinese further west. By the mid-740s, the Tang controlled trade routes both north and south of the Tianshan mountains in modern Kyrgyzstan. Gao Xianzhi (also known as Ko Sonji, a Korean general serving the Tang) had been engaged in a series of campaigns to drive the Tibetans out of the Pamir mountains when a quarrel between the Chabish of Tashkent and Ilkhshid of Fergana erupted (Soucek writes that the ruler of Tashkent used the Turkish title Chabish while the ruler of Fergana used the Iranian title Ilkhshid). The leader of Tashkent allied with the remnants of a tribal confederacy the Chinese had crushed years earlier, so the leader of Fergana called on the Tang for help. 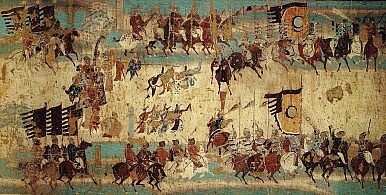 Gao captured Tashkent and its leader while his army sacked the city in 750. Eventually Gao executed the Chabish, whose son fled to the Abbasids in Samarkand for help. The governor of Samarkand, Ziyad ibn Salih, asked Abu Muslim (the Abbasid general who had led the revolt in Merv) for reinforcements and after they arrived set off in the direction of Chinese territory. The two armies met along the Talas river. By some accounts, both sides fielded armies in excess of 100,000 troops each (other estimates are significantly lower). The Tang were reinforced by the Karluks (Qarluqs), a Turkic Central Asian tribal confederacy, a fact which would prove unexpectedly decisive. The Karluks switched sides and attacked the rear of the Tang army as the Abbasids attacked the front. Gao managed to escape but with only a fraction of his army. The battle of Talas, lacking any greater strategic importance, is nonetheless a key piece of Central Asia’s history and provides a crucial lesson that in matters of war and empire, timing is everything. Uzbekistan's past is closely intertwined with that of Tajikistan.